Day 1 : Welcome to Saigon (-/-/D): Warmly welcome upon your arrival in Saigon. Your guide and driver will meet you at the airport for a transfer to your hotel located in the downtown. Your guide’s welcome speech will give you overall information about the city of Saigon. After check in you will have free time to relax, then your guide will see you again for a welcome cruise dinner on the Saigon River. You stay overnight in Saigon. Day 2 : Saigon (B/L/-): You will have a private tour visiting some of its famous attractions such as the Reunification Palace, the Municipal Theatre, the City Post Office, the Notre-Dame Cathedral and the War Remnants Museum. 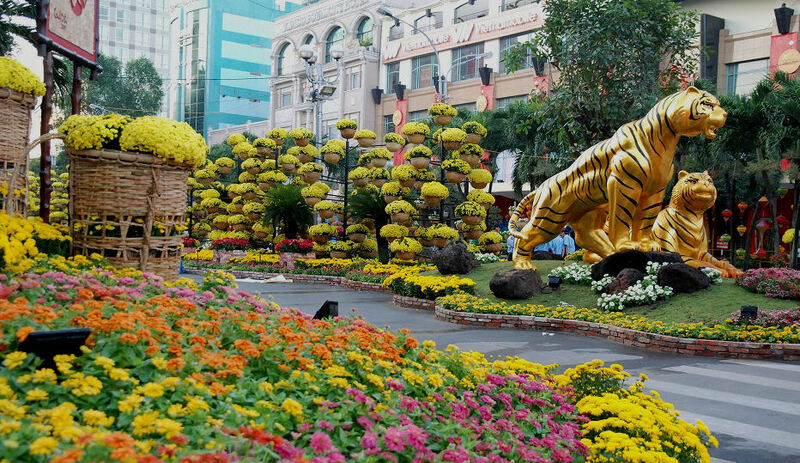 You can also have a walk through the city’s main shopping boulevard with fashionable boutiques and hill tribe crafts, high quality linens and house-wares, the Ben Thanh market, one of the city biggest markets and end up with a walking along Nguyen Hue “TET” Flower Street. You stay overnight in Saigon. Day 3 : Saigon – My Tho – Can Tho (B/L/D): Today you will drive out toward the South-Western Vietnam to Mekong Delta or “Nine Dragon River Delta”. Surrounded by thousands of crisscrossed canals, life in the Mekong Delta revolves much around the river, most of villages are often accessible by rivers and canals rather than by road. After two-hour drive you will arrive in My Tho. Upon arrival you will take a sampan motor-boat on the Tien River to the Thoi Son (Unicorn) islet, one of the four famous islets (Dragon, Unicorn, Tortoise, and Phoenix). From here you follow a village path passing local houses, visiting some family-run coconut candy mill, take a horse-cart from village to village or enjoy a sampan rowing along small canals. Lunch with local dishes will be served right in the garden restaurant. You also have a chance to experience “Southern Vietnamese folk music “, a common art activity in the Mekong Delta performed by local people. Rejoin your car continue to Can Tho, the heart of Mekong Delta. After hotel check in, you will enjoy the hotel facilities at your leisure. Dinner will be at local restaurant. You stay overnight in Can Tho. Day 4 : Floating Market – Saigon (B/L/-): An early wake up today and ready to join in the Mekong Delta floating market, one of the most exciting activities you should do when you are in this area. You can start the motorized boat to visit the Cai Rang floating market, experience how people exchange goods, fruit and many other commodities on their vessels. You easily find the wholesaler big boats which hang the goods she buys/sells on the pole – a mark for reseller small boats knowing where they have to go from a certain distance. You also find floating restaurants, floating bars, floating gas stations, and many other floating shops. After sampling some local fruits at the market, you will be back to the shore and take a bike cycling from village to village on path, over monkey bridges, get in touch with local people. Lunch is at local restaurant before driving back to Saigon for stay overnight. Day 6 : Saigon – Hue (B/-/D): Today you have free time until transfer to Hanoi airport for flight to Hue. Your guide and driver will meet you at the Hue airport for a transfer to your hotel. Located in central Vietnam, Hue used to be the Citadel of the Nguyen Dynasty from 1805 to 1945 and is recognized as a World Cultural Heritage Site by UNESCO. Your guide’s welcome speech will give you overall information about the city of Hue. After check in you will have free time to relax. In the evening you will have a chance to enjoy a Hue Citadel Royal style dinner tasting some Royal cuisines at local restaurant. You will stay overnight in Hue. Day 7 : Hue (B/L/-): Breakfast at hotel then you will have a private trip on the Dragon boat cruising on the Perfume River to visit the Thien Mu pagoda-built in 1601 and, one of the oldest and prettiest religious buildings in the country. From there you rejoin your car to visit the Nguyen Dynasty king Tu Duc’s tomb followed by a visit to a nunnery and enjoy a unique vegetarian lunch at Dong Thien Pagoda. Afternoon you will have a private tour to explore the Hue Citadel. It is a huge complex covering an area of 520ha and comprising three circles of ramparts, Hue Capital Citadel, Royal Citadel and Forbidden Citadel. End of the day you will visit the local Dong Ba market built in 1899 on a bank of the Perfume River – a paradise for snapshots of special TET’s activities. Day 8 : Hue – Hoi An (B/-/D): Today you will leave Hue Citadel for Hoi An Ancient town, another World Heritage site in Central Vietnam. Your trip will travel over the Hai Van pass where you have a stop for a panoramic view over the Lang Co beach before arriving at your hotel in Hoi An. Hoi An used to be an international trade center by sea on the east area in the 16th and 17th centuries. It was the busiest trading port during the reign of Nguyen as merchants from Japan, China, Portugal, Spain, Holland often stopped over to exchange and purchase commodities. After check-in is the free time at leisure to enjoy the hotel/resort services on offer or you can explore the Hoi An town. Your guide will see you again for a dinner at a local restaurant. Tonight you will stay overnight in Hoi An. Day 9 : Hoi An – Ancient town and Tra Que village (B/L): This morning you will ride by bicycle to Tra Que Vegetable Village. You chance to try at actual farming. You will take a trip around the vegetable garden and join the farmers in preparing the land and fertilizing it with seaweed from the local lake. You will also take in a cooking demonstration and enjoy what you have made for your lunch. Afternoon you will have a walking tour to explore the old houses, narrow streets, moss-grown walls, lantern makers. You will stop to visit some of the most interesting sights of the town including Japanese Covered Bridge, House of Tuy Tien Duong, Quan Cong Temple, Old houses, Chinese Assembly Halls and handicraft workshop and traditional arts performance. You stay overnight in Hoi An. Day 10 : Fly to Hanoi (B/-/D): Again you take a one-hour flight to Hanoi. Your guide and driver will meet you at the airport for a transfer to your hotel located in the Hanoi downtown. Your guide’s welcome speech will give you overall information about the one-thousand-year old city and now is the capital of Vietnam. After check in you will have free time to relax, then your guide will see you again for a welcome dinner at a local restaurant. Your first day will be completed by a water puppet show – a unique art performance in Vietnam – before you return to your hotel for overnight stay in Hanoi. Day 12 : Hanoi – Halong Bay (B/L/D): Today you leave Hanoi for Halong Bay (a World Natural Heritage site) via the Red River Delta. Upon arrival you will have a short break at the Café Lounge. Welcome on board. You will set out on a junk cruise on the bay while seafood lunch is served. After lunch, you will take a short trek to a nearby summit for a panoramic view of the bay, swimming on a quiet beach or sunbathing on the sundeck.In the late afternoon, you will take a take a bamboo row boat to visit an interesting fishing village with an opportunity to interact with fishermen who have been living in the bay for almost three generations. You also take a kayak to discover a water tunnel with many coral reefs in a scenic lagoon. Back on board to enjoy watching the peaceful sunset and later unwind at a restaurant. Tonight you stay overnight onboard. Day 14 : Departure (B/-/-): Today is the last day of your Vietnam trip. Enjoy your free time at your hotel or you can do your last minute souvenir shopping before transfer to airport for your flight home. Thanks for joining with us and we hope to serve you for your next trip.